Antimicrobial regimens are usually selected empirically initially based on local epidemiological and antimicrobial susceptibility patterns, and later modified according to the culture and sensitivity test results. Thus, knowledge of the microbiological and antimicrobial sensitivity pattern in any locality is important in making the initial empirical antimicrobial choice and avoiding indiscriminate use of antimicrobial which may lead to emergence of antimicrobial resistant organisms. No published study to the best of our knowledge on this subject has been done in our institution; hence, this study aimed at determining the microbiological profile and antimicrobial susceptibility pattern of DFI in our center. This was a retrospective study of DFIs in our institution. Following ethical approval, 'ref no ABUTH/HREC/47/2016 dated 21st July 2016.' All procedures were carried out as per the guidelines given in Declaration of Helsinski 2013. The case files of all patients with DFI admitted into our facility from January 2014 to December 2015 were retrieved. Those with no trace of microbiological culture report or missing clinical information about the DFI were excluded. Patients with complete medical records had their swab specimen microbiological culture and antimicrobial susceptibility results reviewed. 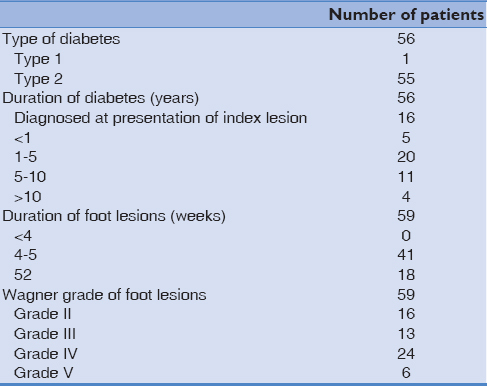 Patients' demographics, duration of diabetes before onset of the foot lesion, duration of the DFI at presentation, grade of the lesions in accordance with the Wagner classification [Table 1], microbiological isolates, and antimicrobial susceptibility data were collated, analyzed, and correlated. The specimens were cultured aerobically using standard microbiological technique on blood, chocolate, or MacConkey agar plates for 24 h at 37°C. Gram's staining was also done. Biochemical identification of isolates that presented as Gram-negative bacilli was done using the triple sugar iron agar, Simmons' citrate, urea agar, and peptone water; while those that presented as Gram-positive isolates were subjected to identification using catalase, coagulase, or bacitracin. The isolates were subjected to antimicrobial susceptibility by the Kirby–Bauer disk diffusion method using commercially prepared single antibiotic disks, and the result was read after another 24 h incubation at 37°C. The results were presented in tables. Sixty-three patients were admitted with DFI during the period under review, but 56 patients had complete medical records and were reviewed. There were 35 males and 21 females. The mean age of the patients was 56.2 years (range: 48–75 years). Three patients had bilateral lesions. The clinical characteristics of the patients are shown in [Table 2]. There was no Wagner grade 1 lesion. The outcomes of treatment are shown in [Table 3]. 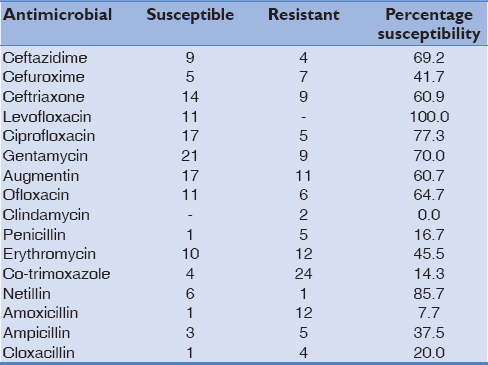 Eight bacterial pathogens and a fungus were isolated from 59 swab specimens studied [Table 4]. Four specimens yielded no growth while seven specimens yielded contaminants. Forty-five specimens yielded monomicrobial cultures, whereas three specimens yielded polymicrobial cultures. Two of the three polymicrobial cultures came from Grade IV DFI, whereas one came from grade V DFI. Of the pathogens, two were Gram-positive bacteria, whereas six were Gram-negative bacteria and one was a Candida species. The prevalence of these groups of microbes in relation to the different diabetic foot grades are shown in [Table 5]. 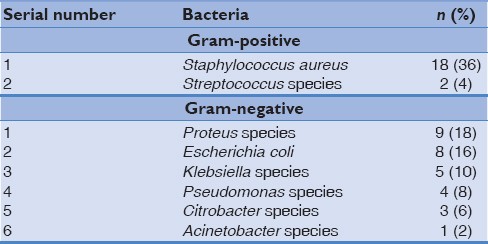 Gram-negative bacteria accounted for 30 (60%) of the isolates, whereas Gram-positive accounted for 20 (40%). S. aureus was the most common isolate, being cultured in 18 (38.3%) of the specimens, followed by Proteus species 9 (19.1%). The isolates were most susceptible to levofloxacin (100%), ciprofloxacin (77.3%), and gentamycin (71%), whereas greater resistance was shown to co-trimoxazole (14.3%) and amoxicillin (23.1%) as shown in [Table 6]. DFI spreads rapidly leading to irreversible tissue damage, an effect facilitated by suppressed immunity, late presentation, underestimation of extent of infection, and inappropriate/indiscriminate antimicrobial use. In our study, the mean duration of diabetes was 5 years. This is similar to the findings in some studies., This contrasts with the finding of another study, which found a much longer mean duration of 14.0 ± 10.8 years among German patients. This difference may be due to differences in the quality of diabetes care. It could be that the Germans receive better diabetes care which delays the onset of foot lesions. Most of our patients presented to the hospital late (mean duration of 16 weeks from onset of the lesion). Majority of our patients presented between 8 weeks and 36 weeks. This is similar to the findings of some studies., This late presentation may explain the predominance of grade III and IV lesions, as well as preponderance of Gram-negative organisms which are known to colonize severe diabetic foot ulcers, in our study. It may also explain the high number of DFI that eventually had either minor or major amputation. This may be due to illiteracy/ignorance, poverty and attempts at traditional medication or faith healers. Monomicrobial cultures accounted for greater percentage, whereas polymicrobial cultures accounted for lesser percentage of the positive cultures from our study. This is similar to that reported by Tiwari in Northern India, but in contrasts to the predominantly polymicrobial cultures reported in most studies where both aerobic and anaerobic cultures were done.,,, This may be due to the use of only aerobic culture media in our study, which could have made it impossible to isolate the anaerobic organisms in these monomicrobial-cultured specimens. DFI are known to be predominantly polymicrobial in severe/late cases, and this probably could have been the same in our study if both aerobic and anaerobic cultures were done, considering the preponderance of severe (Grade III and IV) DFI among our study population. There was a predominance of Gram-negative organisms in our study. This could be due to the preponderance of severe (Grades III and IV) diabetic foot disease from which the swabs were taken, which are known to be colonized predominantly by Gram-negative organisms. This is similar to the findings of most studies.,,,,,,,, Although some researchers reported preponderance of Gram-positive bacteria,, one of such studies, the Tabriz study, used selected DFI specimens, even though they neither stated the Wagner grades of their patients DFIs nor their selection criteria. It is possible that most of their specimens were from early DFIs such as grades I and II, which are usually first colonized by Staphylococcus and Streptococcus species. S. aureus was the most common isolate in our study, and this is in line with findings from most studies.,,,, However, Tiwari et al. and Ako-Nai et al. reported Escherichia coli as the most common isolate, whereas Shanmugam et al. reported Pseudomonas species as the most common in their studies. The different findings in these other studies may be from the type of specimen they used, which were deep wound swab and tissue specimen. Proteus species was the most common Gram-negative bacteria Isolate in our study. Ramani et al. and Kengne et al. also made similar observation in their studies. The isolates in our study showed higher susceptibility to levofloxacin (100%) and ciprofloxacin (77.3%) among others. This is similar to the findings of Unachukwu in Port Harcourt, Bansal et al. in India, and Kengne et al. in Cameroon. On the other hand, the isolates showed higher resistance to amoxicillin and co-trimoxazole among others. Of great concern is that the isolates showed high resistance to some of the commonly used empirical broad-spectrum antimicrobials in our center, such as cefuroxime (58.3%), ceftriaxone (39.1%), and co-amoxiclavulanate (39.3%). This may signify the emergence of resistant strains of some of the isolates to these broad-spectrum antimicrobials following their indiscriminate use over the years. In our study, four patient's specimen yielded no growth. This is not uncommon in patients who have had indiscriminate multidrug therapy before the collection of the specimen, and especially in our instance, where only aerobic culture was done. This is unlikely to culture any anaerobic organism in the specimens. Seven of the specimens yielded contaminants. This could be due to the nature of the specimens, superficial wound swabs, which could have been contaminated by skin flora. The absence of anaerobic culture is a limitation to this study. This is because of the high-cost implication of providing routine anaerobic cultures. If anaerobic cultures were done, it would have identified the obligate anaerobes which are often present in DFI, especially the late stages and hence their antimicrobial susceptibility determined. Another limitation is the nature of the specimens used in this study, which were superficial wound swabs. A wound tissue culture would have been ideal. A third limitation is the possible variation in the antibiotic disks used. A future collaborative prospective study with other large health facilities, culturing wound tissue specimen in both aerobic and anaerobic culture media for a better microbial yield; and also, possible determination of the presence of multidrug-resistant bacteria such as methicillin-resistant S. aureus and extended-spectrum β-lactamase producing Gram-negative bacteria are needed to improve our antimicrobial therapy in DFI. The major limitation of this study is its retrospective design with attendant possible missed data. The range of microbial isolates and antimicrobial resistance in our study lends credence to the need for specimen culture and antimicrobial susceptibility guided therapy in DFI. Our study reveals that bacterial isolates from DFI in our locality are more susceptible to levofloxacin and ciprofloxacin. Pending the availability of microbiological culture studies, we suggest empirical treatment of DFI with either levofloxacin or ciprofloxacin in our locality, which also has the added advantage of being relatively cheaper. Boulton AJ. The diabetic foot: A global view. Diabetes Metab Res Rev 2000;16 Suppl 1:S2-5. Singh N, Armstrong DG, Lipsky BA. Preventing foot ulcers in patients with diabetes. JAMA 2005;293:217-28. Abdulrazak A, Bitar ZI, Al-Shamal AA, Mobasher LA. Bacteriological study of diabetic foot infections. J Diabetes Complications 2005;9:138-41. Richard JL, Sotto A, Lavigne JP. New insights in diabetic foot infection. World J Diabetes 2011;2:24-32. Mendes JJ, Marques-Costa A, Vilela C, Neves J, Candeias N, Cavaco-Silva P, et al. Clinical and bacteriological survey of diabetic foot infections in Lisbon. Diabetes Res Clin Pract 2012;95:153-61. Tiwari S, Pratyush DD, Dwivedi A, Gupta SK, Rai M, Singh SK, et al. Microbiological and clinical characteristics of diabetic foot infections in Northern India. J Infect Dev Ctries 2012;6:329-32. Akhi MT, Ghotaslou R, Asgharzadeh M, Varshochi M, Pirzadeh T, Memar MY, et al. Bacterial etiology and antibiotic susceptibility pattern of diabetic foot infections in Tabriz, Iran. GMS Hyg Infect Control 2015;10:Doc02. Unachukwu CN, Obunge OK, Odia OJ. The bacteriology of diabetic foot ulcers in port Harcourt, Nigeria. Niger J Med 2005;14:173-6. Al Benwan K, Al Mulla A, Rotimi VO. The study of the microbiology of diabetic foot infections in a teaching hospital in Kuwait. J Infect Public Health 2012;5:1-8. Viswanathan V, Jasine JJ, Snehalatha C, Ramachandran A. Prevalence of pathogens in diabetic foot infection in South India Type II diabetic patients. J Assoc Physician India 2002;50:1013-6. Oyibo SO, Jude EB, Tarawneh I, Nguyen HC, Harkless LB, Boulton AJ, et al. A comparison of two diabetic foot ulcer classification systems: The Wagner and the university of Texas wound classification systems. Diabetes Care 2001;24:84-8. Van Baal JG, Harding KG, Lipsky BA. Foot infections in diabetic patients: An overview of the problem. Clin Infect Dis 2004;39:S71-2. Nyamu PN, Otieno CF, Amayo EO, McLigeyo SO. Risk factors and prevalence of diabetic foot ulcers at Kenyatta national hospital, Nairobi. East Afr Med J 2003;80:36-43. Abbas ZG, Lutale JK, Morbach S, Archibald LK. Clinical outcome of diabetic patients hospitalized with foot ulcers. Dar es Salaam, Tanzania. Diabet Med 2002;19:575-9. Morbach S, Lutale JK, Viswanathan V, Möllenberg J, Ochs HR, Rajashekar S, et al. Regional differences in risk factors and clinical presentation of diabetic foot lesions. Diabet Med 2004;21:91-5. Doumi A. Diabetic septic foot in El Obeid, Western Sudan. Sudan J Med Sci 2007;2:119-21. Raja NS. Microbiology of diabetic foot infection in a teaching hospital in Malaysia: A retrospective study of 194 cases. J Microbiol Immunol Infect 2007;40:39-44. Shanmugam P, Jeya M, Susan SL. The bacteriology of diabetic foot infection, with a special reference to multidrug resistant strains. J Clin Diagn Res 2013;7:441-5. Bansal E, Garg A, Bhatia S, Attri AK, Chander J. Spectrum of microbial flora in diabetic foot ulcer. Indian J Pathol Microbiol 2008;51:204-8. Sekhar S, Vyas N, Unnikrishnan M, Rodrigues G, Mukhopadhyay C. Antimicrobial susceptibility pattern in diabetic foot ulcer: A pilot study. Ann Med Health Sci Res 2014;4:742-5. Sugandhi P, Prasanth DA. Microbiological profile of bacterial pathogens from diabetic foot infections in tertiary care hospital, Salem. Diabetes Metab Syndr 2014;8:29-32. Ako-Nai AK, Ikem IC, Akinloye OO, Aboderin AO, Ikem RT, Kassim OO. Characterization of bacterial isolates from diabetic foot infection in Ile-Ife, South Western Nigeria. Foot 2006;16:158-64. Ramani A, Ramani R, Shivanadan PG, Kundaje GN. Bacteriological infections of diabetic foot ulcers. Indian J Pathol Microbiol 1991;34:81-7. Kengne AP, Choukem SP, Dehayem YM, Simo NL, Fezeu LL, Mbanya JC, et al. Diabetic foot ulcers in Cameroon: Can Microflora prevalence inform probabilistic antibiotic treatment? J Wound Care 2006;15:363-6. Anvarinejad M, Pouladfar G, Japoni A, Bolandparvaz S, Satiary Z, Abbasi P, et al. Isolation and antibiotic susceptibility of the microorganisms isolated from diabetic foot infections in Nemazee hospital, Southern Iran. J Pathog 2015;2015:328796.